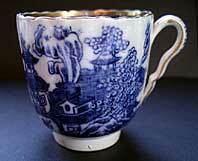 "One of the rarest and earliest of the Spode transferware patterns Two Figures I on an important reference example of Staffordshire pottery. 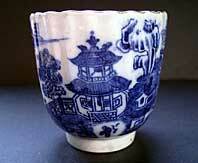 Surviving early pearlware teawares are few and much rarer than the more durable porcelain examples. 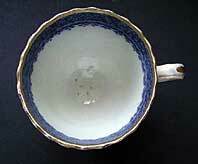 This fluted coffee cup shape can be dated to c.1785-95 and is similar to that found on Caughley porcelain. 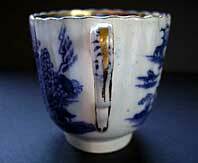 The flattened double kick handle, like an old hair grip - is most unusual - perhaps unique to early Spode. The Two Figures pattern design is one of the patterns referred to by Simeon Shaw, in his "History of the Staffordshire Potteries" 1829, as among the first engraved and blue printed patterns on Staffordshire Spode. Shaw dates experimentation and first production to c.1783-84." Antiques Expert Hamilton Bear. 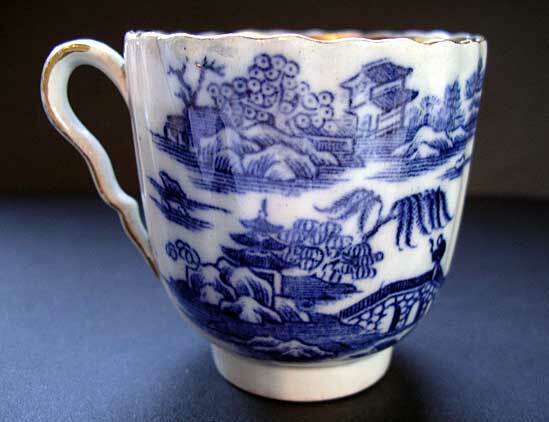 References: See Spode's Willow Pattern & other designs after the Chinese, Robert Copeland pg. 67 plate 1, for the original Chinese pattern of Two Figures I. Also pg. 69 plate 5 for a stand in Two Figures I pattern. Compare with the 'standard' version Two Figures II pg. 69 plate 7. Two Figures II is the reworked and more common version but still rare. Two Figures I, when found, is stylistically much closer to the original Chinese prototype. Engraving is quite basic but very effective with the use of strong graphic lines. Dimensions: width 250 mm max. 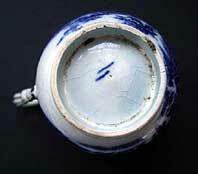 Marks: one of the earliest Spode workman's marks as illustrated. Condition: Very good and an excellent display item. Condition report: No staining, chips or restoration. Three tight short hairlines extend from the rim of the cup. Hairlines are clear/faint on the outside - difficult to spot. They can just be seen on the cup interior extending below the printed band. Piece remains very stable and durable.